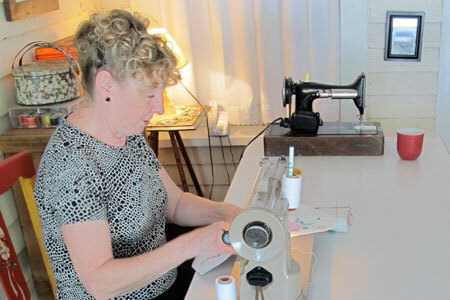 The seeds for this story began with the article by Dorrie Hammant “Living on a Budget” (August 28 Advertiser) which stirred the frugal nature in this writer – Dorrie using her sewing machine to create wedding attire. Then our graphic designer (Jo Ann Amos) at this newspaper gave notice in order to spend more time reworking old, fine linen and cotton into window treatments, and with her newly acquired 1954 electric sewing machine – making something from what some might call throw-a-ways. Jo Ann’s ancestry is English (her grandmother and mother came here in the —–) and thriftiness and frugality have shown in her choice of work, especially now. No wonder that Mrs. Hammant would strike the note for this story! Ed. Note. Jo Ann Amos came to the Advertiser as the “new newspaper” started in January of 2003. She was as new in the production of the newspaper through the computer as every one else on the staff, and together they all learned to produce a newspaper that was called, early on, “the best example of a community newspaper.” She has announced that, after over ten years of splendid work, she is leaving the newspaper, to once again “go back home” where she loves to be, but not idle at home, rather venturing into another “challenge,” this time in the art of creating window treatments for the home from up-cycled, vintage linens and trims. Before the sewing challenge is explained, it is important to know Jo Ann from her past history, for that is definitely one thing that is pulling her in the direction of home. 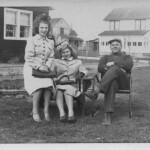 “I grew up on Long Island, New York, among people who were proud of his work (strong work ethic), influenced by women who were homemakers and created a home for their families with skills and a strong sense of independence,” says Jo Ann, who came to a town, some twenty years ago, that does not mind looking back (some say we look back too much!). In “family before her,” she is particularly referring to a grandmother who loved her and gave her one whole week of her time each summer (and Jo Ann’s kitchen is now a replica of hers) and an auntie and mother who had a perfectionism in them that taught her to do things right (she admits to having a “bossy and controlling” nature that springs from perfectionism). 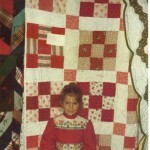 Quilting was the perfect art form for her in the 70s and 80s and she made her first quilt with a simple red and white patchwork for her daughter Elizabeth. The completion of that first quilt was the driving force for many more bigger and more complicated pieces culminating into her final quilt which is displayed in the hallway of her home on Buncombe Street. When they made that addition to their home on L.I., they lacked an oak floor for a while; so she painted the underflooring a blue and stenciled a colonial pattern on the edges in white, and suddenly she felt a challenge coming her way. How to turn this stenciling into a business. She has always reached out to read (Adelle Bishop’s book on stenciling) and study how such artwork is developed and did so as she started a business of stenciling and painting in others’ homes. Her children were grown when they moved south, and she then looked for full time work. All of her training gave her what she needed to become, eventually, art director at a printing company in Augusta. She learned to operate a Mackintosh computer there as printing progressed in offset work. Then her husband was retiring and the need to work outside the home was less pressing, and home she came – and that is when the Advertiser asked her to join the team here. “I can give you 10 hours a week,” she said. Always with one foot in her art and another at home, she continued with her skills until she and Pamela started Paperwhites, where she explored the market in gently used clothing. 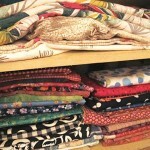 It was contemporary clothes at Paperwhites which attracted buyers, although she had one small rack of vintage clothing. 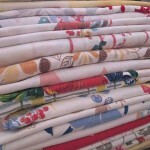 She saw the market was ripening for vintage clothes and vintage linens, so she concentrated more on them. As Paperwhites closed she moved to the Web to market her merchandise, and so developed “Betty and Babs,” her site found on ETSY, a large Web site open to sellers of a variety of merchandise. 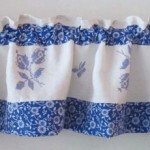 The Web site evolved from linens and clothing and accessories, then dropped the fashion items altogether and now it offers custom made window treatments in addition to vintage linens, fabrics and trims. 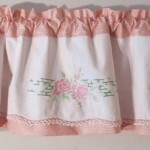 The idea for the window treatments came out of the need to find a use for linens that were beyond the help of cleaning or repairing but still maintained beautiful workmanship from those “homemakers” she so admired. It is interesting that in using old textiles to create new items reminiscent of the past the modern day computer is just as valuable to her as her old Singer as the answers to all questions are just a click away:How do I use this attachment for my vintage sewing machine? What is the best way to remove yellow stains from vintage damask linen? Where can I purchase vintage cotton rick rack? “Betty and Babs” are the names of her mother (Betty) and Aunt Barbara who grew up with their perfectionistic auntie. Between them and the grandmother whose kitchen lives on in her house, she has “mentors” from the past assisting her still. She has begun to take fine linens, pieces of them that are still beautiful, and create window treatments that are unique and artistic. The photographs accompanying this article tell the story; each design can be made of several pieces of goods, some holding needlework or designs done by someone years ago, that took days to finish and deserve being shown in someone’s home. Vanity doilies are no longer popular, but placed in the window they are a reminder to the owner of her own heritage, of someone who did such work in her own family. “It looks just like what my grandmother had on her dresser,” said one of Jo Ann’s customers. She enjoys the lengthy dialog with her customers online exchanging ideas, likes and dislikes, until a plan is finalized. Jo Ann then pulls from her bins of used, laundered and sorted linens and cottons to create, in color and design, what her customers are asking for. 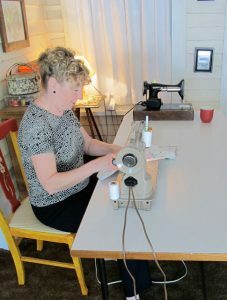 Here Jo Ann is using her “best friends” in her artwork, her 1954 Singer 301 Sewing Machine. 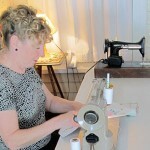 She has recently bought the earlier Singer electric (on the table) that, after a trip to the sewing machine expert for a cleaning, will be put to use also. Jo Ann’s hairdo is so complimentary to the work she does, and to her home, which salutes the era of the 40s and 50s in particular. This is the piece de resistance, as the French would say, the climactic quilt that satisfied the artist in Jo Ann enough that she says she will not be quilting again. IT holds pieceing, stitching and stenciling. Her home is also filled with folk art, some of which she created, such as theorem paintings framed in handpainted wooden frames, another of her specialties. 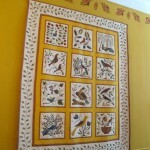 This was the first quilt that JO Ann made and the first quilt show in which she exhibited. It was made for her daughter Elizabeth who is standing in front, at age 6. 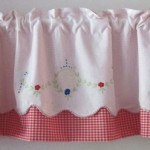 A sampling of Betty and Babs window treatments made with remnants of tablecloths, dresser scarves, pillowcases. 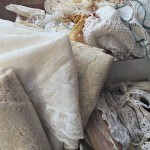 Other materials used are luncheon and dinner napkins, doilies, vintage lace and trims. 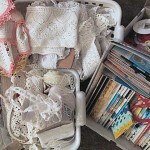 Vintage fabric, tablecloths, lace, rick/rack, embroidery, ribbons and buttons fill baskets and shelves waiting to be selected for the next vintage textile mix project.